Distributor: Currently licensed by Anime Midstream. Notes: This title is pronounced "Beat X" ... or if you want to get really picky with the Japanese pronunciation, "bee-toe-eck-koo-sue". Whatever you do, don't say "apostrophe" out loud unless you really feel like mocking this thing. Based on the manga by Kurumada Masami (Saint Seiya). Capitalizing on the popularity of shows such as Samurai Troopers (Ronin Warriors in North America) and Saint Seiya with female audiences, B'tX is a story where pretty boys beat each other up while riding mecha shaped like various animals. Okay. What is the point of this show? From the beginning, you're treated to various random scenes of character interaction that are supposed to lead into the plot, but really don't make any sense. And then, suddenly, the hero, out of the blue, is astride this shiny metal mecha that looks nothing so much as one of the emaciated steeds from a Hieronymus Bosch painting. Ooh. Fight equally decrepit-looking animal mecha with villain on it. Ooh. Watch your brave heroes beaten up for the sake of some chick or other. Ooh. Was I supposed to be impressed by this at all? The action scenes are boring, the characters are boring, and the mecha designs are boring. And the music, well, it was okay, if hopelessly cheesy ("I am now setting sail for my dream! "), but it doesn't keep the show from being absolutely, well, boring. In fact, the only remotely interesting thing about this show was the weird title! Also, I must state that the animation on this TV series has to be some of the most mediocre I'd ever seen. Speed Racer looks better. And the over-the-top "I CAN YELL LOUDER THAN YOU!" voice acting doesn't excite me one bit. Let's face it. Posing and bleeding does not a good battle make. 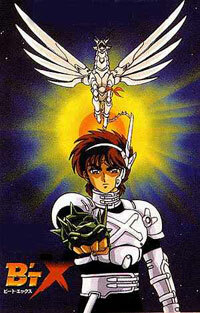 The designs may be similar to your favorite bishounen shows, but don't expect to be impressed by -any- aspect of B'tX. Samurai Troopers, while just as over the top and hokey (and maybe more so) has vastly more interesting characters, and the TV series even pretends to have a coherent plot half the time! If you insist on seeing pretty boys being beat up for any reason, watch that, or Saint Seiya, or something else. You'll probably enjoy your anime a lot more that way. Recommended Audience: Whee! Bishounen fights! Blood! Manly suffering! Which means no little kids, but maybe the stray fawning fangirl may actually like this series. Who knows? Our ex-roommate, however, insists she has more taste than this, which is a bad sign for all you bishounen fans out there.